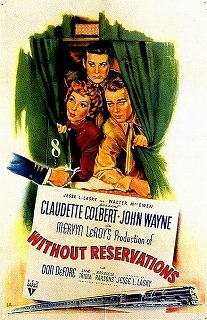 Without Reservations is a 1946 American comedy film starring Claudette Colbert and John Wayne, directed by Mervyn LeRoy, and released by RKO Radio Pictures. The film was adapted by Andrew Solt from the novel Thanks, God! I'll Take It From Here by Jane Allen and Mae Livingston. The opening shot shows "Arrowhead" Pictures motion picture studio. This is the actual RKO Radio Pictures building at 780 Gower Street in Hollywood, retouched with "Arrowhead" replacing the RKO signs on the building. It remains a historic structure on the corner to this day. Successful author Christopher "Kit" Madden (Claudette Colbert) travels to Los Angeles to work on the film adaptation of her best-selling book Here is Tomorrow. It is supposed to star Cary Grant as the Army Air Forces pilot hero Mark Winston and Lana Turner, but Grant has just dropped out and the producer thinks they need an unknown actor to play Winston. On a train to Hollywood, Kit meets two Marine pilots, Captain "Rusty" Thomas (John Wayne) and 1st Lieutenant "Dink" Watson (Don DeFore). She considers Rusty the best choice to play Mark Winston, but he is dismissive of her book: she wrote a political allegory and he does not believe Cary Grant would refuse Lana Turner for 400 pages. Unsure how he will react if he discovers she is a famous writer, she keeps her identity secret (saying her name is "Kitty Kloch"). After they are expelled from the train for drunkenness in a remote prairie town, the trio are given a ride in a rainstorm by a man who then trades them his car for Rusty's German war souvenir. The trio continue on and are welcomed at the farm of a large Hispanic family with an amorous daughter who showers attention on Rusty. They then flee there due to a misunderstanding. When Rusty finally learns Kit's true identity, he thinks that she has been using him just so he would be in the motion picture. Nonetheless, after a number of missteps, the couple eventually reach Hollywood and are able to resolve their differences. Jack Benny, Dolores Moran and Cary Grant make uncredited cameo appearances, as does director Mervyn LeRoy. The film was originally budgeted at $1.1 million and had the title Thank God, I'll Take it From Here. The film made a profit of $342,000. ^ "Box office / business for Without Reservations". IMDb.com. Retrieved June 11, 2009. ^ Variety (October 5, 2017). "Variety (January 1947)". New York, NY: Variety Publishing Company. Retrieved October 5, 2017 – via Internet Archive. ^ Variety (October 5, 2017). "Variety (September 1945)". New York, NY: Variety Publishing Company. Retrieved October 5, 2017 – via Internet Archive.